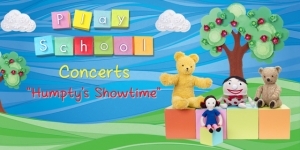 Play School concerts began in the mid 1970’s and since then the concert tours have travelled around Australia entertaining over 100,000 people annually. Kids Promotions have been presenting the Live Play School concerts since 2001.We are a family owned and operated event management and promotions company focussed on quality live children’s entertainment. We are privelaged and proud to be associated with this much love brand for so many years. In 2019 Play School's National tour "Humpty's Showtime" will be heading around the country starting in Victoria in March and making it's way around the country. If you want to see you children get soooo excited when their favourite toys appear on stage or be delighted when they sing and dance along to their favourite nursery rhymes then come to see why Australian families choose Play School as the number 1 Live Concert for kids. South Australia, Western Australia & New South Wales Presenters yet to be announced - we will announce them in the coming months on our Facebook page or via email to our members.